Qualcomm Technologies Inc. made its name as the world’s biggest suppliers of microprocessor chips, but in recent years the company has taken a shot across the bow of Intel Corp., muscling into its territory with a class of chips designed to power personal computers. Today, the company stepped up its Intel attack with a brand-new processor called the Snapdragon 8cx, which it says is the first seven-nanometer central processing unit designed for Windows 10 PCs. Qualcomm’s expansion into Intel territory is spearheaded by its “Always On, Always Connected” PCs, which are a class of laptops powered by its Arm-based Snapdragon chips. The push began with its low-powered Snapdragon 835 and 850 mobile platforms designed exclusively for Windows 10, which were released earlier this year. But the company’s Always On, Always Connected PCs are aimed at users who need a laptop that can keep them connected throughout the day while also delivering the same power as Intel’s PCs, and the new Snapdragon 8cx chips are designed to do exactly that. 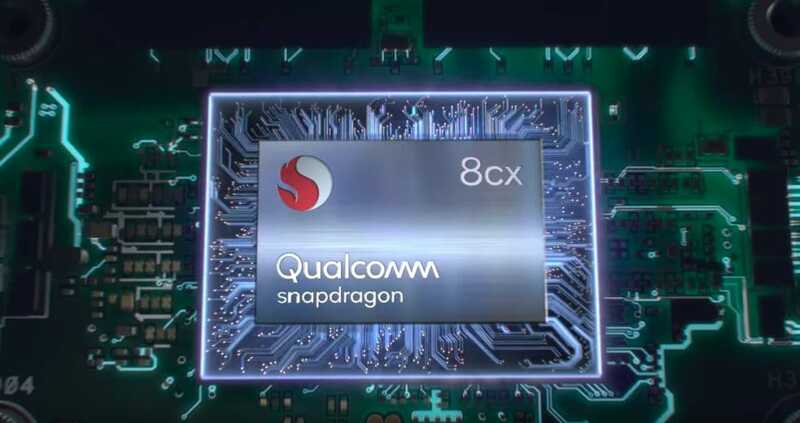 At its Snapdragon Tech Summit Thursday in Maui, Hawaii, Qualcomm said the new 8cx chips are a new tier compared to the less powerful 850 variant. In contrast to Intel’s CPUs, which Qualcomm said favor performance over battery life, the 8cx delivers a better balance of the two. Key to this improved balance is the 7nm process, which is the most advanced manufacturing process technology for chips available today. In order to make chips more powerful, the companies that make them need to shrink the transistors, which are tiny electronic switches that process data. The basic premise is that the smaller the transistors are, the better the performance and battery life will be. The world’s first mass-produced 7nm process chip was Apple’s A12 Bionic processor, which is used to power its latest iPhone XS and XS Max devices. That was followed by the even more powerful A12X, which is used in Apple’s latest iPads. But so far there aren’t any 7nm chips in PCs because Intel, which dominates the market, is still struggling to perfect its 10nm process. Intel’s main rival in the PC market, Advanced Micro Devices Inc., has built a 7nm graphics processing unit chip for PCs. Qualcomm said the first devices powered by the 7nm Snapdragon 8cx chip will go on sale in the third quarter of next year. It claimed they’ll deliver a superior performance per watt compared with Intel’s latest-generation PC chips. According to the company, the seven-watt fanless Snapdragon 8cx can achieve a level of performance comparable to Intel’s 15-watt fan-cooled U-series chips. That puts it at around the same level as Apple’s A12X, which is said to match the performance of Intel’s high-end iCore 7 chips. Qualcomm’s 8cx system-on-a-chip uses many of the same processors and components as the new Snapdragon 855 for mobile devices, which was announced yesterday. These shared components include Wi-Fi 6 (802.11ax) and Bluetooth 5 wireless cores, a Hexagon 690 digital signal processor, a Snapdragon X24 LTE modem for up to 2Gbps cellular speeds and on-chip security features. However, it also boasts some “extreme” elements that give it a more powerful punch than its smaller cousin. These additional elements include the new Kryo 495 CPU, which is said to deliver 50 percent higher sustained performance at seven watts than Intel’s 15 watt U-Series chips. Another improved component is the Adreno 680 “Extreme” GPU, which features a 128-bit wide memory interface that gives it twice the speed of its predecessor, the Adreno 650 GPU, and 60 percent greater power efficiency than the Snapdragon 850. The 8cx also supports up to 16 gigabytes of LPDDR4x random-access memory, with greater bandwidth, as well as speedier NVMe solid-state drives. That could be crucial, since it means the chips should finally have enough memory to handle the demands of Windows 10, which was one of the major shortcomings of the 850.